You may or may not have seen that a couple of weeks ago on Nick Jnr a new pre-school animated series started called 'Poppy Cat'. We love Nick Jnr, Isla loves Peppa Pig, Ben & Holly's Little Kingdom and Humf, so it was inevitable that we would catch this new programme at some point and to be honest for me it's nice to have a break from her usual favourites! Once you start to watch it you realise that the main character Poppy Cat has a very recognisable voice and it is none other than Joanna Page, the actress who plays Stacey in 'Gavin and Stacey'! This is her first go at playing an animated character and she clearly loves it. 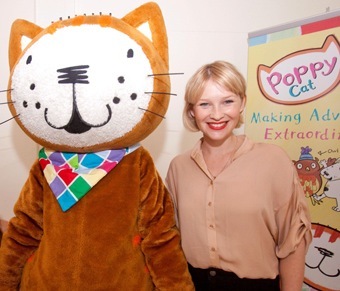 Poppy Cat is based on the award winning books by Lara Jones, which have sold over 2.5 million copies worldwide. The stories take preschollers on fantastical adventures and excite their imaginations. The series features 26 x 10 minute episodes. The show revolves around Lara a young girl who invents stories for her beloved cat Poppy. Once she starts reading a story, children are transported to a world of adventures where animals walk upright and talk. They go on adventures in Hot Air Balloons, Submarines and Pirate Ships and travel to magical destinations including the Trumpet Tree Forest and Marshmallow Mines. The show is so colourful and bright and the main theme running throughout is friendship, Poppy Cat is the glue that holds her little gang together. Isla and I have now watched a few episodes of Poppy Cat together and she has really enjoyed it! When we received the press pack for the show we hadn't yet seen the programme, so when it came on the screen she immediately recognised it and went and retrieved the gorgeous pop up book that we received. 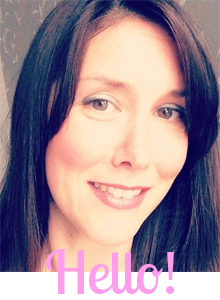 She loves animals and knows what all the characters are and can follow the stories. We interact during the show, as I talk to her about what's going on throughout and ask her questions. Poppy Cat is on Nick Jnr (Sky 615, Virgin 715 and Talk Talk 318) every day throughout May - TUNE IN!